Wikimedia Philippines and Mozilla Philippines will hold their 2nd Open Web Day on March 17, 2012 at 9am-4pm at Room A1103, Br. Andrew Gonzalez Hall, De La Salle University in Manila. 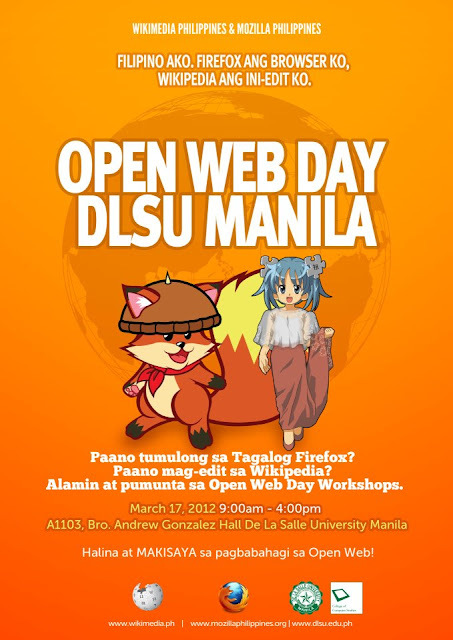 Open Web Day is a free monthly mini-workshop that aims to teach how to edit Wikipedia entries online. Slots are very limited. Register only when you are sure that you're attending. To register, go to: http://owdmanila.eventbrite.com/.